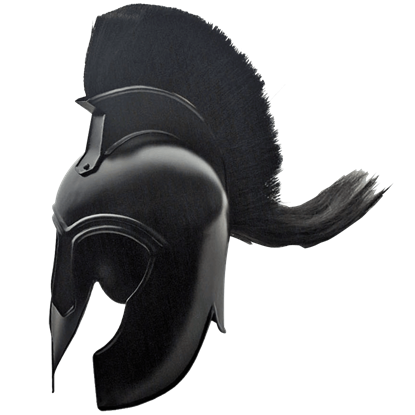 Like the helmets of their forbearers, Roman helmets and gladiator helmets are iconic of Roman warriors and are, therefore, almost instantly recognizable. 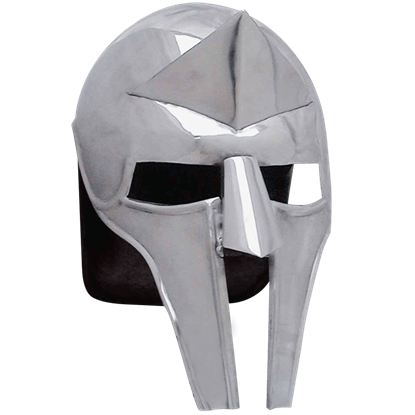 Here at Medieval Armour, we endeavor to provide the widest selection of Roman helms possible, offering both the recognizable helms depicted in movies and fiction as well as the esoteric and elaborate ones worn in history. 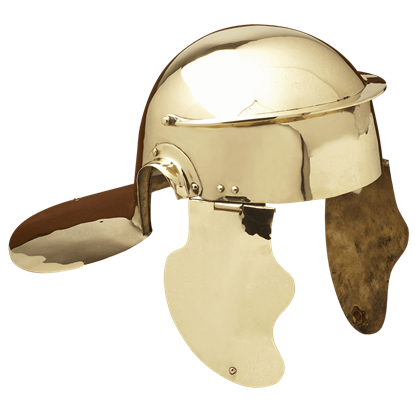 Roman helmets had many names, depending on its function, although the most typical roman helmet was the galea, or the imperial helmet (note that galea is Classical Latin for 'helmet'). The imperial helmet was worn by virtually every member of the Roman war machine. That is not to say that all Roman helmets were the same, though, because as you can see here, many had subtle differences, which helped to separate, say, the roman trooper helmet and the roman soldier helmet from the roman guard helmet. The crested Roman helmets found here were typically reserved for officers and military leaders, as the plume or crest signified importance (and sometimes, duty). Unlike classic Roman helmets, though, gladiator helmets were infinitely more distinctive and varied. This is because most gladiator helmets, unlike the Greco roman helmets of the day, were designed to be both a help and a hindrance to the warrior wearing them. All in all, though, there's a wide variety of Roman helmets gladiator helmets to be seen here at Medieval Armour, which means that if you planned on seeing them all, you'd best get to browsing. 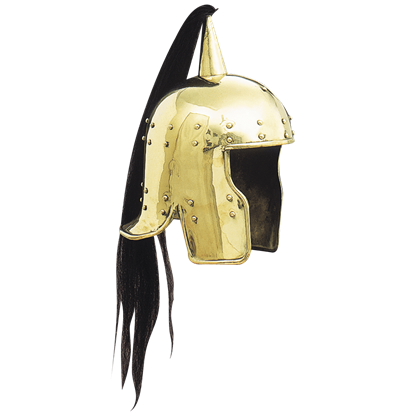 Featuring an impressively stylized design, this 1st Century Roman Cavalry Embossed Helmet is a decorative helm that would have likely been favored by members of the Roman cavalry, especially by officers enlisted in their ranks. A Roman legion is typically seen as a grouping of shield-bearing warriors armed with gladii and pila (sword and javelin). However, legions did often include archers, who more often than not could be seen wearing this Archer Helmet. Crowds roar and the intense heat of the arena is enough to boil ones blood. Your adrenaline is high as you ready for the fight to finish. Don this helm and look through the visor to see through the eyes of a gladiator! There are certain perks to forgoing a heavier helmet and choosing something a little bit more unrestrictive. This Auxiliary Infantry B Helmet, for instance, is a happy medium between offering good protection and unrestrictive wear. 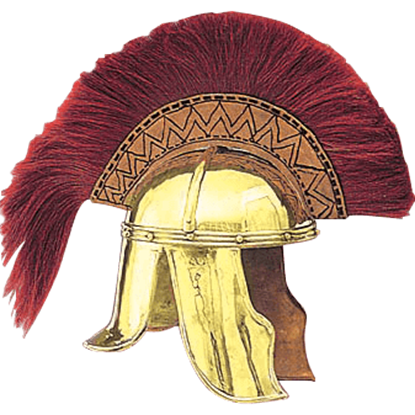 This style of helmet was typically worn by the Roman Auxiliary troops, which were non-citizen soldiers of the Roman Empire. This Auxiliary Infantry E Helmet would have been worn by soldiers who wanted good protection for their head. 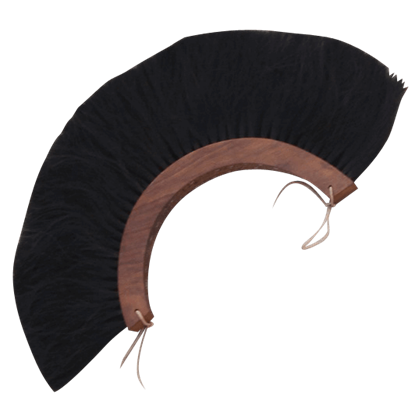 Plumes were not just ornamental decorations that were attached to helmets for reasons of style. In fact, a decoration like this Black and Natural Plume would have been significant, indicating a person or officer of importance and rank. Plumes were not just ornamental decorations that were attached to helmets for reasons of style. In fact, this Black Helm Plume with Wood Base would have been very significant, indicating a person or officer of importance and rank. Ancient Greek armor really does not get any more iconic than a Corinthian helmet with a long plume. 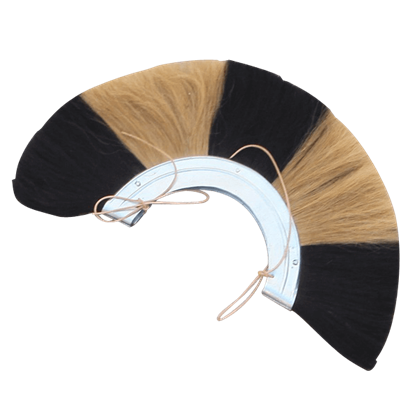 This Black Plumed Trojan Helm is a sleek way to recreate the look of a mighty Greek Warrior in your decor or period themed costume. 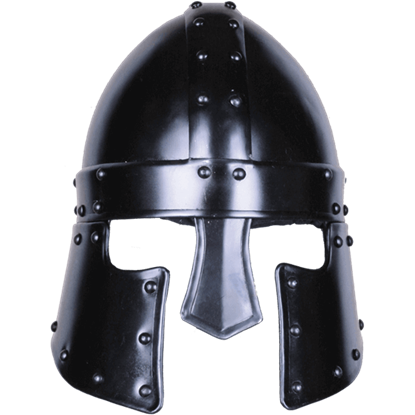 Inspired by the late Roman Empires horseman helmet, the Blackened Halanor Barbuta Helmet provides good protection to the wearers head and face and possesses an impressive look for LARP warriors and collectors to enjoy. 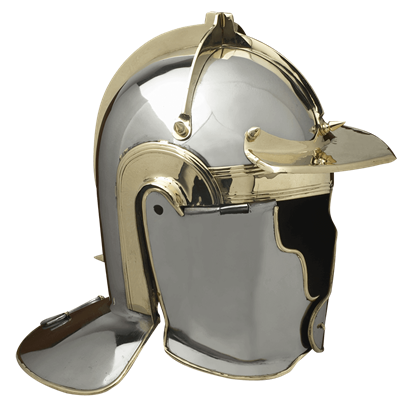 The Brass Cavalier Roman Helmet is the perfect combination of a Roman helmet designed to provide protection to a warriors head and flashy, impressive styling that makes the wearer difficult, if not impossible, to mistake or miss. 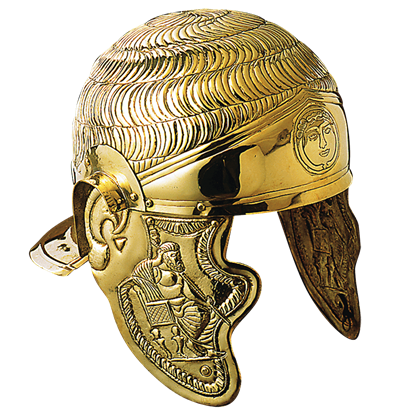 Typical Roman adornments on helmets included tall hair plumes, although others were used. 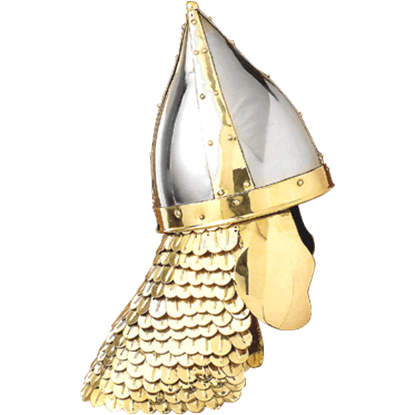 And on the Brass Charioteer Helmet, instead of a classic, stiff hair plume, the helmet features a simple black hair tassel as decoration. 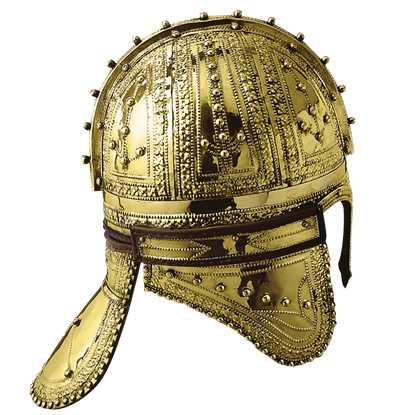 Named after the region of the Netherlands in which the original helmet was found, this Brass Deurne Helmet is a reproduction based off of an actual historical helmet that featured amazing and attractive decorations across its surface.